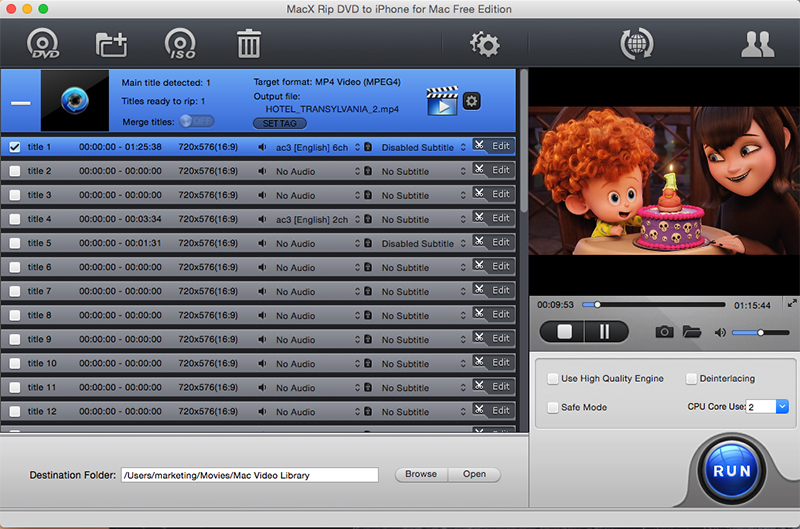 MacX Rip DVD to iPhone for Mac Free Edition is a 100% free and fastest DVD to iPhone ripper software for iPhone users. You can easily rip almost all kinds of DVD movies to iPhone MP4 video format as well as MOV, MP3, AAC, AC3 etc. With MacX Rip DVD to iPhone for Mac Free, you will leisurely enjoy your favorite DVDs on your iPhone 5S, iPhone 5C, iPhone 5, iPhone 4S without any difficulty. - It supports ripping any DVDs to the video file (MP4) playable on iPhone, converting DVD to MOV, MP3 for playback on media player. - This free DVD to iPhone ripper tool is fully compatible with all generation of iPhone, including iPhone 5S, iPhone 5C, iPhone 5, iPhone 4S, iPhone 4 etc. - This Mac free iPhone DVD ripper can convert both home-made and protected commercial DVDs. - With this free DVD to iPhone ripper, user can extract audio from DVD as ringtone, take snapshot you favor from DVD as wallpapers. - Powerful editing features help you easily edit the video, including trim, crop, merge, watermark, subtitle etc. - Flexible parameter settings make it easy for you to customize individual videos, such as frame rate, video resolution, video bitrate, audio volume, etc. - By supporting Multi-core CPU, Hyper-threading technology and high quality engine, the free iPhone DVD ripper for Mac provides fast video conversion speed and superb video quality.